Following the team’s visit to the White House in April, New England Patriots’ team owner Robert Kraft gave President Donald Trump a commemorative Super Bowl ring. 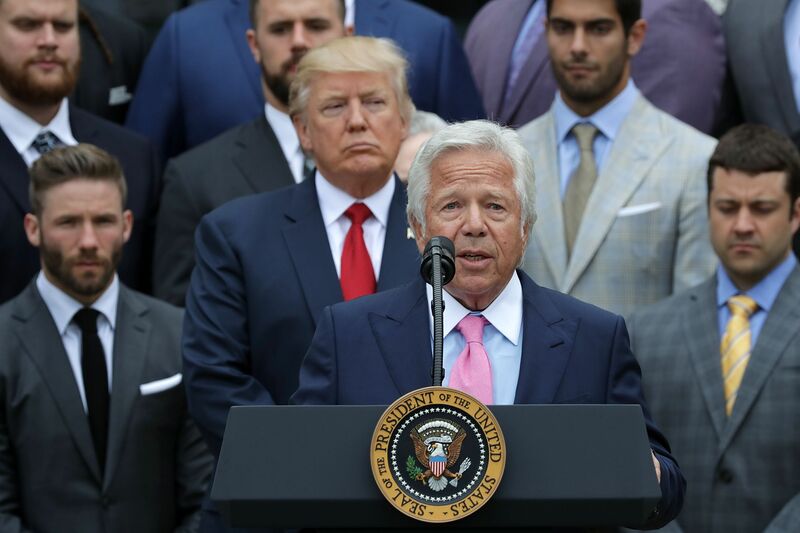 Confirming initial reports by CSN New England, New England Patriots’ spokesman Stacey James told USA Today that Patriots’ team owner Robert Kraft did, in fact, give President Donald Trump a Super Bowl ring after the team visited and toured the White House four months ago. The Patriots won Super Bowl LI over the Atlanta Falcons following the greatest comeback in the game’s history, rallying from a 28-3 deficit to win the game by a score of 34-28 in the first overtime Super Bowl in NFL history. Trump and Kraft are longtime friends, so the gesture by Kraft to give Trump the customized ring comes as no surprise. Fittingly, the Patriots were the first championship-winning team to make a visit to the White House during the Trump administration, so Kraft felt that giving the 45th President of the United States a Super Bowl ring was necessary. Trump has been outspoken about his support of the now five-time world champions thanks to his friendship with Kraft and future Hall of Fame quarterback Tom Brady. He even predicted an eight-point win by the Patriots when prompted by Bill O’Reilly about what he thought the game’s outcome would be. Knowing what happened in the game, he sure wasn’t too far off, although it’s hard to think he saw it unfolding the way it did. After all, who did? After the game, Trump unsurprisingly took to Twitter to congratulate the Super Bowl LI champions, who became the first team to visit him in the White House just two months after the epic comeback. While the ring may end up having to be archived due to the fact that there is a $375 limit on gifts received by U.S. presidents, James reported that ring was intended to be a part of Trump’s Presidential Library until another commander-in-chief is sworn in anyway. Do you think Kraft’s kind gesture was appropriate, or do you believe he went bit too far? Let us know in the comments below, and be sure to follow along with FanSided for news, opinions, and analysis stemming from numerous different sports.